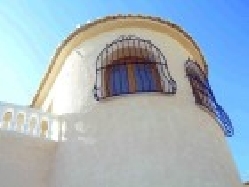 VILLAS AND APARTMENTS TO RENT IN CUMBRE DEL SOL, SPAIN. 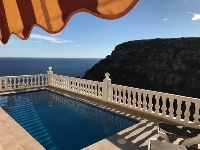 Welcome to our selection of holiday homes to rent in Cumbre del Sol, Spain. Cumbre del Sol is a purpose-built residential resort on the Costa Blanca, between the more established towns of Moraira and Javea. 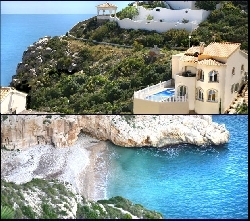 Located high on the cliffs overlooking the Mediterranean, the development is in an area of outstanding natural beauty, surrounded by green belt land and interesting beaches and coves. As one of the older �new� resorts on this stretch of coast, Cumbre del Sol has all the amenities both tourists and residents could need, including supermarkets, a pharmacy and even an English primary school. The stretch of coast below Cumbre del Sol is very rocky, with sheltered coves more than long, wide stretches of sand. This does mean that you can often find quieter spots to relax, even in the summer months. The Lleibeg cove is one of the more difficult to reach, but as well as being a beautiful place to sunbathe, is also packed with local history, including an old surveillance hut that was used to monitor smuggling. It takes fifteen minutes to follow the path down the cliffs from Pueblo Monetcala near Cumbre del Sol, and the climb back up is probably unsuitable for younger children. A much easier walk will take you to the Morach beach and the nearby Los Arcos cave, where you can try out diving in a safer environment than the open sea. In the summer, there is a beach bar open here which serves drinks and snacks during the day. Finally, the Los Tiestos cove, just over the headland from the Morach beach is a popular spot for nudists. The area around Cumbre del Sol is ideal for those who enjoy outdoor and sporting activities. The Granadella nature park has a network of walking paths of varying difficulties and lengths to help you explore this unspoilt region of a very over-developed stretch of coastline, while El Puig de la LLoren�a is a great place to enjoy a spectacular view along the Costa Blanca, if you can manage the climb up to 400 metres above sea level! Other sports on offer in the area mainly revolve around the sea, including scuba diving, windsurfing, waterskiing and sailing. If you prefer to stay on dry land, there are several golf courses in the region and a number of equestrian centres where you can join pony trekking trips through the countryside. Finally, the main tourist resort of Benidorm, with its larger beaches and theme parks, is only a short drive away along the main motorway that threads its way along the coast. Looking for self catering holiday accommodation in Cumbre del Sol? Then below is a selection of apartments in Cumbre del Sol and villas in Cumbre del Sol that can be rented direct from their owners. You can either click on each listing for further details or you can use our search engine on the left if you are looking for something in particular.